Talstar PL Granular Insecticide with its unique sand core granular structure, provides long-term protection against insects in lawn, gardens and landscaped areas for two to four months. Talstar PL penetrates deep into mulch and grass to kill pests where they breed and hide. Simply spread the granules over the lawn and water in according to the label directions. Talstar PL Granular Insecticide is similar to sand, and therefore can penetrate deep into the soil. PL means perimeter and lawn. Nothing causes more irritation than insect pests invading your lawn and home. Talstar PL Granules is the perfect product to eliminate these pesky insects. Talstar PL Granules are the perfect product to protect your lawn from insect pests, including: ants, fleas, ticks, crickets, centipedes, and spiders. A single 25 pound bag should cover 5,000 to 10,000 square feet. This is 2.3 to 4.6 pounds per 1,000 square feet. Talstar PL Granules should provide around 2 to 3 months of protection from insect pests. To distribute Talstar PL Granules, you'll want to use a spreader to efficiently cover the desired area. The granules are most effective when they penetrate deep into the lawn. This way they are able to kill insect pests where they breed and hide. To expedite this process you will want to water the desired areas in accordance with the recommended amounts on the product label. 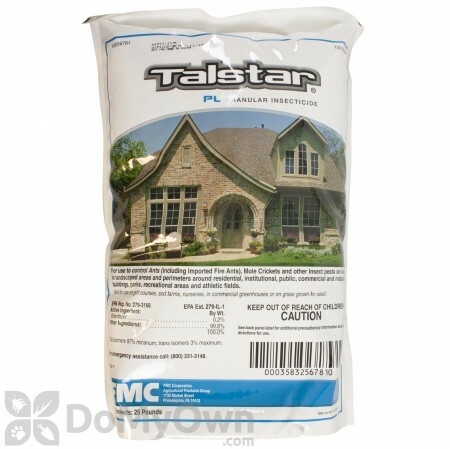 Talstar PL Granules are generally used in one of two ways: It can be applied as a perimeter barrier directed in a five to ten foot band around your home, or it can be broadcast over your entire lawn, including landscaped areas. And it’s that easy with the expert help of Do My Own Pest Control dot com! Subscribe to our channel for more DIY and product videos! Talstar PL Granular Insecticide are used to control Ants (including Imported Fire Ants), spiders, fleas, ticks, worms, crickets, and almost all other insect pests on lawns, in landscaped areas and gardens, and perimeters of residential, institutional, public, commercial and industrial buildings, parks, recreational areas and athletic fields. Talstar PL release chemical over time as it rains. One application of Talstar PL can protect lawn areas for 2 to 3 months. It is safe against non-target animals such as birds, pets, and other mammals. Talstar PL Granular Insecticide is generally used in two ways: It can be applied as a perimeter barrier directed in a five to ten foot band around your home, or it can be generally broadcast over your entire yard including landscaped areas. A normal application usually consists of three to five pounds of product. It is recommended to apply Talstar PL with an Earthway spreader. One 25 lb. bag treats 5,000 to 10,000 square feet. Always read the label. To ensure optimum control, treat the building perimeter at dusk to prevent outdoor scorpions from entering the building. Scorpions reside hidden in cracks and voids during the day and are active at night at temperatures above 77ºF/25ºC. Resting areas can be identified at night using a blacklight (UV bulb) as scorpions will fluoresce. These areas should also be treated. Prior to treatment, to increase treatment efficacy, remove trash, debris, or firewood that scorpions may use as resting sites. Talstar PL Rate per Acre - 100 - 200 lbs. Talstar PL Rate per 1000 sq. ft. - 2.3 - 4.6 lbs. Do not apply more than 0.2 lb. active ingredient (a.i.) per acre per application on residential use sites (i.e., around private homes, apartment buildings, condominiums, non-agricultural outbuildings, non-commercial greenhouses, pre-schools or day care facilities). May be applied at up to 0.4 lb. a.i. per acre per application on non-residential use sites (i.e., around institutional, public, commercial or industrial buildings; parks; recreational areas or athletic fields). Do not broadcast apply more than 0.4 lbs. A.I. (200 lbs. Talstar PL Granular) per Acre per year. Not for use on golf courses, sod farms, nurseries, in commercial greenhouses or on grass grown for seed. I always had problems with ants but could not get rid of them. I was told about Talstar PL from a professional who had great success with the product. I purchased a 25lb bag and spread it as instructed, the next day I went and checked on the ant piles and low and behold the ants were at the top of the mound DEAD. I haven't had any ant piles or ants in my yard for 7 months. I just bought my second bag, I figure with all the rain here in South Louisiana it was time to retreat. GREAT Stuff. I'm trying to control fire ants and mole crickets, I have been using Talstar PL Granules for the past 4-5 years. It works fine so far. A great product to be used in Florida. There is not an ant or cinch bug present in my yard after the treatment. Comparable services from companies like Chem Lawn will cost you up to $120.00 for a product like this. The granules were easy to spread and the smallest package available from this website covered about 1/4 acre lot. I was impressed with product and service. I applied the Talstar PL Granules @ 2-3 weeks ago. The ants appeared to have been killed. I am cautious to say this as I am waiting for the real hot summer weather as this is when they become very active. Never the less I have 50 lbs left over so I can apply when I need it. I hope that the ants have left me as I have a very large infestation in my lower yard. Thank you and I will be contacting you soon when I need more Talstar. I have not had to use the liquid yet. P.S The ordering and the service from you was fantastic. I received my items @ 3 days from when I ordered. The free freight sure is a big bonus!!! How soon after watering in the Talstar PL Granules can you let your pet on the treated surface? It is perfectly safe to let your pet back on the treated surface once the Talstar PL Granules have been watered in and the treated area is completely dry. Is Talstar Granules safe to use in the yard around my dog? I have a dog that is always eating something he shouldn't be. The pest service I use wants to apply the Talstar granules in my yard. I'm concerned about letting my dog around any chemicals for fear of him possibly ingesting it. What should I do? If the Talstar PL Granules product label is followed, then the granules will not be available for your dog to ingest. Usually, the granules are applied to the lawn and then immediately watered in, sending the insecticide into the soil and thatch layer. Your dog should be removed from the yard prior to the application and should not return until the application is dry. And don't forget, you can save money by purchasing the Talstar PL Granules and applying them yourself and you can have piece of mind knowing that the product label was followed. Can I use Talstar Granules for Chinch bug control on St. Augustine grass? I have a cinch bug problem that has crippled my beautiful st. augustine lawn. We were about to resod, then I saw this. Will it work and if so will the grass grow back? 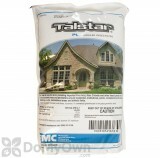 Talstar granules are one of the most effective chinch bug treatments on the market. Chinch bugs infest the base of grass plants and are often found in the thatch layer. Irrigate the treated area with up to 0.25 inches of water immediately after application to activate (release from the granule) the insecticide. Chinch bugs can be one of the most difficult pests to control in grasses and the higher applications rates will be required to control populations that contain both nymphs and adults during the summer. It may also be necessary to remove the thatch layer if it exceeds 1 inch in thickness to allow the Talstar to penetrate down to the soil. If you have a few small spots the St. Augustine runners might fill it in this season (of course water, fertilizer, and lots of sunshine helps). If large portions of the lawn were damaged it will likely be late spring or later of next year before the lawn recovers. Very heavily damaged areas may need to be resodded. Can I eat vegetables and herbs that Talstar PL was applied to? Talstar PL granules was spread around my organic vegetable garden, some actually on the lettuce. Is my garden now contaminated? Are my vegetables and herbs safe to eat? 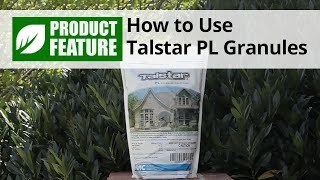 Talstar PL granules are not labeled to be used on edible vegetation. We recommend discarding any herbs or vegetables that the Talstar PL granules was applied to. How much area will a 25lb bag of Talstar PL Granules cover using a spreader or by hand? Depending on the insect you are treating one 25LB or Talstar PL will treat approximately 5,000-10,000 square feet. Please read the product label to determine the usage rate for the insects you are trying to eliminate.